One piece of rock solid stainless steel with a heat-treated black finish. 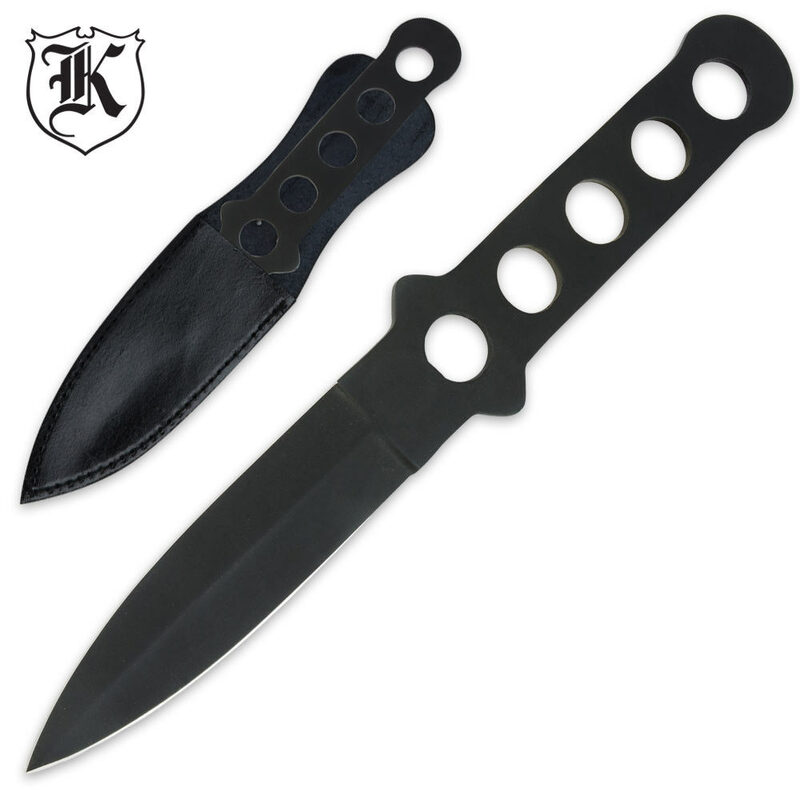 The 3-3/4" blade is double edged for deep penetration, and the handle features ergonomic cut-out holes, making this a superb oversized throwing knife. 9" overall length. Includes sheath. Very basic stamped metal knife. Blade is actually fairly sharp, and they at least tried to dull the edges off the flat stock handle but you'd definitely want to wrap it if you're going to do any serious use. Sheath is flimsy, I wouldn't actually wear it but it will at least keep the knife from poking anything if you toss it in a bag. Price is right for a disposable knife, it takes up an absolute minimum of space so is suitable for a backpack, glove box, etc. for situations where any knife is better than no knife. Not great but it fulfills expectations of a $4 knife. Not bad at all for $4 knife. It sticks everytime I throw it and I admittedly have no idea what im doing, so that has to count for something haha. Seems like it would be great for customizing. For the price, you can't go wrong. Great holdout/ditch blade, and good balance.That being said, for those who complain about it being low quality and cheaply made, "don't by a 4 dollar knife and you won't get 4 dollar quality! When you purchase cheap, you get what you paid for!" Lastly, if it's dull, sharpen it. "Rocket Science." The knife looks just like the picture. I didn't have great expectations, being a 4$ knife but for the money its not bad. It was somewhat sharp out of the box and fits the hands well. The sheath was ok but made out of a synthetic material to look like leather. I don't think the sheath would stand up to everyday carry and would come apart. Over all though this is going to be my beater knife and maybe thrower. I don't think everyone would want this knife but there are those like me that like a good deal and can always use a utility knife or beater. Im happy with the purchase. The knife is not the best but, it is a $4 knife, So when you consider that, it is a pretty good knife for the money. It is light enough to where you do not notice that you have it but, it is heavy enough to throw well. The sheath is not good for belt carry but it does protect the blade. 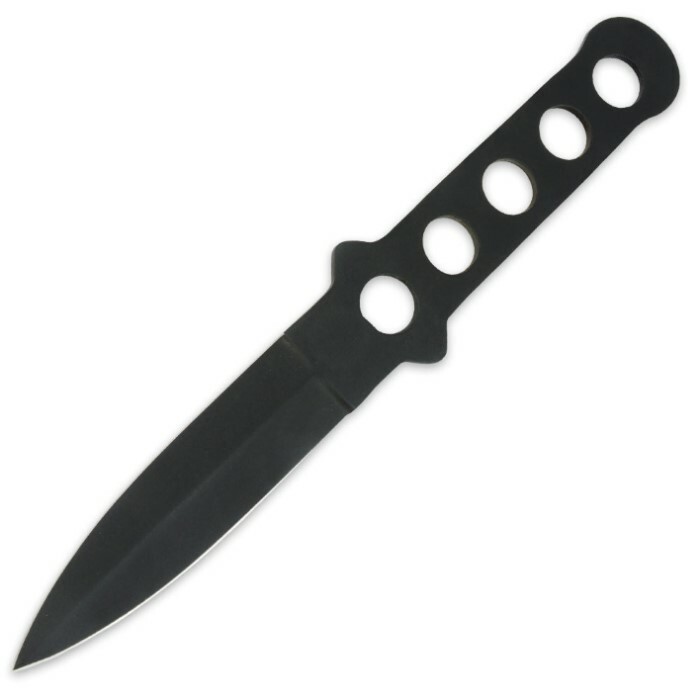 This is a good utility/throwing knife to put in a pack or a kit. The best part is, it is all steel. If you have a problem with it you can just work it out. First of the second I picked up the sheath it felt crusty and cracked, turning it over I could see that it must have been in a damp warehouse because there was mold on the inside, the sides and stitching are peeling and the leather itself was warped. The knife itself was even worse, the edge was HORRIBLE, jagged edges and duller than a butter knife. The only good thing it has going for it is the balance and weight. I plan to work on the blade and see if I can fix the edge, you get what you pay for. Unless you don't mind fixing the blade yourself, don't buy this knife. Placed order on 12/15/14 arrived 01/09/15. I understand with the holidays there will be a delay but, when I called, several times, I forgot the number times I got It is in the warehouse and it will be shipped tomorrow. The knife is well balanced and sharp. The sheaf is questionable as to how long it will last, and I did a drop test on a 1/2 inch piece of particale board and the tip bent. I can work it out with a stone but, I am not happy.